Please be patient while some aspects of the KFPS website are updated. The menu system in particular was broken, and a new one has been recreated. 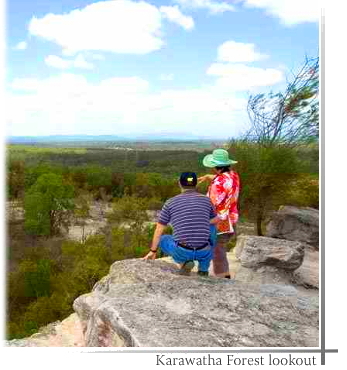 In 1991 the Karawatha Forest Protection Society was formed in response to the groundswell of public opinion which wanted to see this bushland saved from development. The Brisbane City Council introduced a Bushland Levy in the same year which made the purchase of significant lands possible. The State Government also made valuable contributions to the size of the Forest. Because of its strategic importance, Council has dedicated some adjoining lands to become part of Karawatha Forest. The Forest will be further enhanced through the protection of natural corridors and addition of land through the Bushland Levy. Karawatha Forest is now managed by the Brisbane City Council with guidance from a management plan which was set up with community consultation. This stipulated that the Forest be used for passive recreation purposes. Karawatha Forest is approximately 1000 hectares of bushland and coastal lowlands on the southern edge of Brisbane City, on Acacia Road, Karawatha, Queensland Australia. see our Contact page, thank-you. Your feedback is much appreciated.